At the outbreak of World War I, the Union Defence Force had realised the urgent need for air support which brought about the establishment of the South African Aviation Corps (SAAC) on 29 January 1915. On 1 February 1920 Colonel Pierre van Ryneveld was appointed as the Director Air Service with the task of forming an air force, The date has since been used to mark the founding of the South African Air Force. In December 1920 the South African National insignia was added to aircraft for the first time. The first operational deployment of the newly formed Air Force was to quell internal dissent, when in 1922 a miner's strike on the Johannesburg gold mines turned violent and led to the declaration of martial law. 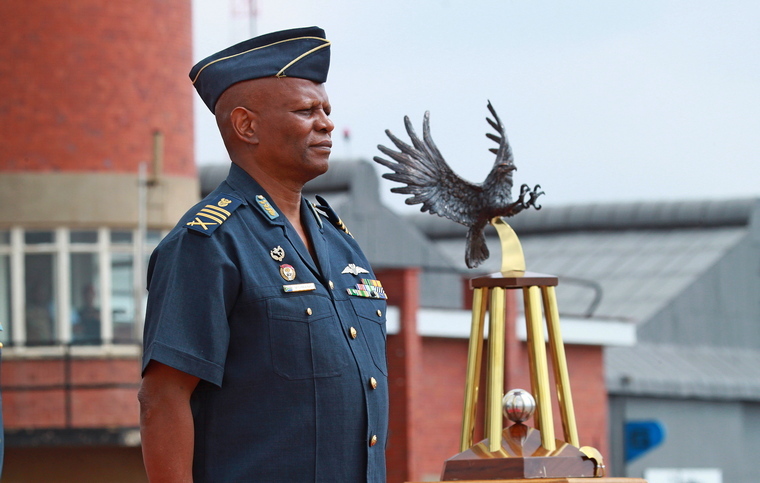 On Friday 1 February the SAAF AFB Zwartkop hosted the SAAF's annual Prestige Day celebrating the 99th year of the establishment of the Air Force and a quarter century of a democratic air force. The opening flypast of two Agusta A109s. Under the theme "Collective Heritage" the purpose of the parade is to celebrate and acknowledge exceptional performance by directorates, bases, squadrons and units and to thank all members of the Air Force for their dedication, loyal support and hard work during the previous year. 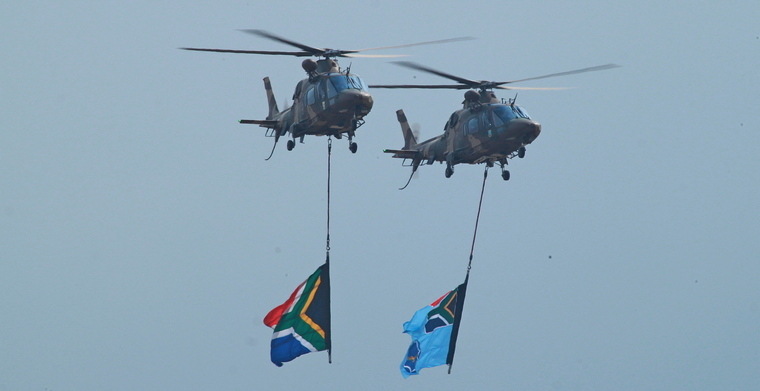 The ceremony included a mass formation fly-past of most of the SAAF's current assets. The lead formation consisted of two SAAF Museum Alouette IIIs, a Bosbok and Cessna as well as a SAAF Rooivalk and four Oryx. 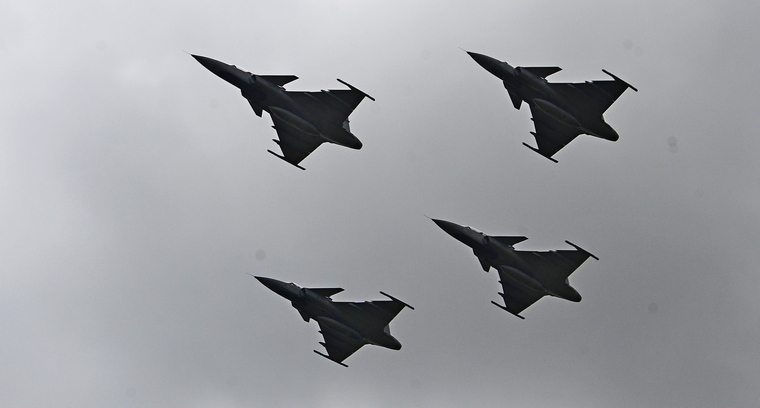 Other aircraft included two Hawks, four Gripens as well as a five ship Silver Flacons formation as well as two King Airs. Three Harvard completed the day's displays. 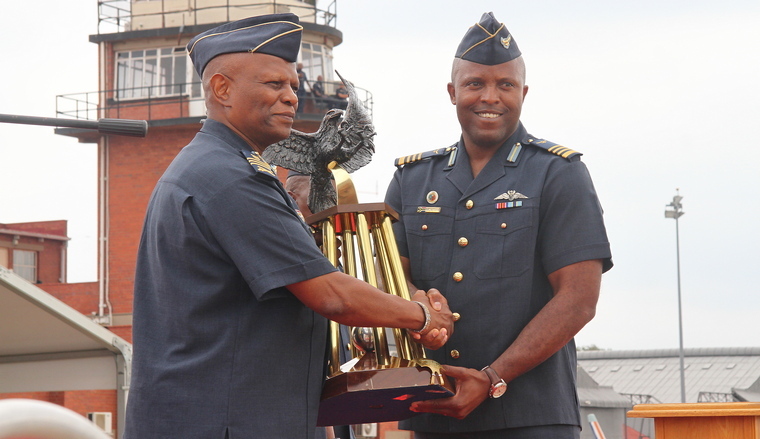 Chief of the SAAF, Lieutenant General Fabian Msimang, presided over the day's proceedings and besides the inspection of members on parade, made up by members off the different units of the SAAF, AFB Ysterplaat walked away as the winner of the Prestige Award. The Prestige Awards recognise exceptional performance among units, bases and directorates in the SAAF. AFB Ysterplaat was declared the winner this year. The Air Force Band Troop. "What price are we all willing to pay to protect this freedom that some seem to take for granted?" Lieutenant General Msimang asked during his speech. "Those who believe that we do not need a potent National Defence Force will one fine day learn afresh that indeed freedom is not free." Gen. Msimang and entourage inspecting the parades. "The level of defence ambition requires our Defence Force to be appropriately equipped, resourced and trained in support of South Africa's national security, national interest and foreign policy. The National Defence Force is the nation's insurance policy - and we all have to take collective responsibility of not allowing this policy to lapse. It is unethical to expect commanders who are under-resourced to train and prepare troops for battle and humanitarian missions." General Msimang continued. Some of the units on parade. Last year the General made a call to the defence industry industry regarding its role in the SAAF and during his speech he reported that he was satisfied the industry has heeded the call to prioritise the SAAF's requirements. However, the Chief of the Air Force does seem to be concerned with the current financial situation at Denel. 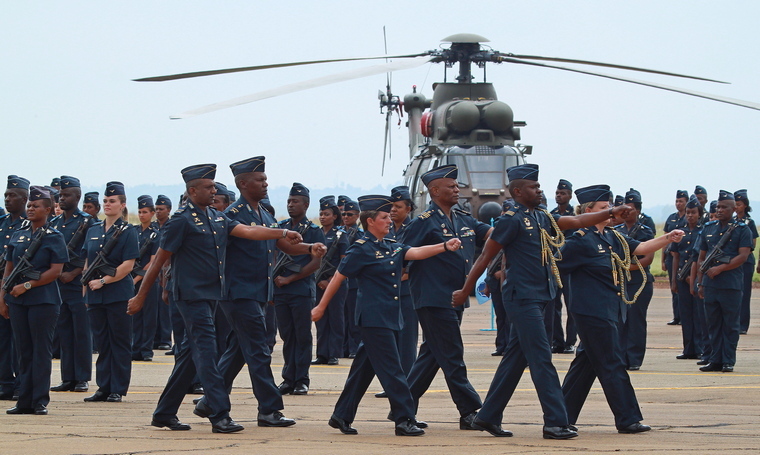 Denel is strategic partner to the SAAF and the challenges it is facing will, if not resolved, impact negatively on the wellbeing of the SAAF's fleet of Rooivalk and Oryx helicopters. Gen. Msimang concluded by thanking and congratulating all the members that took part in the parade for a splendid and sound performance of military discipline and etiquette.